Fans of A Will Away will note the instrumental progression over previous material and a more laid-back pace than the songs found on the group’s previous efforts — early 2014’s Cold Weather and their late 2014 split with Head North. Despite the transition to a more emo-infused style of the vocally powerful pop rock that A Will Away have been perfecting for years, the band has retained all of the qualities we’ve come to love about their sound on “My Sitter.” Lead vocalist Matt Carlson shows incredible control and range throughout the track before launching into full power in the final notes of the last chorus. Carlson’s rhythm guitar work plays exceptionally well with lead guitarist Collin Waldron’s impressive harmonic interplay — clean, tasteful lead guitar work draws the verses together and adds another layer of interesting melody to an already musically dense track. “My Sitter” and the rest of Bliss was recorded at Maximum Sound Studios in Boston, Massachusetts by Gary Cioffi. Cioffi’s previous work includes Transit’s Listen & Forgive and Joyride, Daytrader’s final song “Rita,” and Misser’s Every Day I Tell Myself I’m Going To Be A Better Person. If you’re a fan of any of those releases, you’re sure to love Bliss. Stream “My Sitter” below and check out A Will Away on Twitter and Facebook. Quiet Fire Media can be found at Twitter, Facebook, and Tumblr. You can (and should) pre-order Bliss here. We’ll be delivering more content with A Will Away as their year progresses, so make sure to keep an eye on our home page. 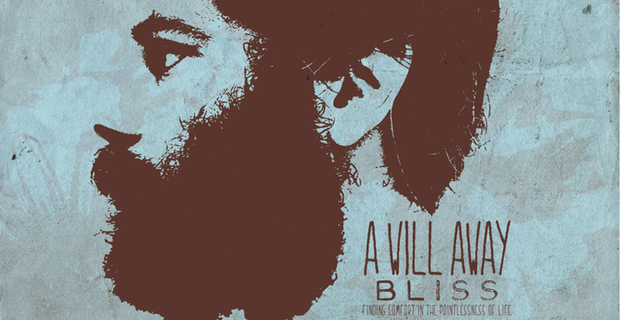 A Will Away previously released a track from Bliss, “Cheap Wine,” over with our friends at AbsolutePunk.